Wow – long time, no post, heh? I really hate it when people start off a blog post like “oh, it’s just been so long since I’ve blogged…” but there you have it. It’s been a while. Again. So, lets see – when last we chatted we’ve had winter. A very mild winter this year. I was getting worried, and then it seemed to finally arrive, almost as an afterthought, in about late February/March. Fortunately, though, we got a nice amount of rain to top off the reservoirs, and a good amount of snow for the spring skiiers/snow-boarders of the Sierra. So, now we’re well into Spring, and smiling at Summer just around the corner. Folks all have their gardens planted, the vineyards are all leafed out and flourishing, the livestock have donned their summer coats; there are spring calves on the ground, the winter lambs are all now sturdy little folks keeping up quite nicely with their flocks, and the green grass of early spring is beginning to turn the hills golden as it dries out. We’re seeing the tourists on weekends more – car shows and spring concerts have begun – fishing and boating in the reservoirs have replaced the snow sports – and the foothills are gearing up for summer. One day recently while out in service, we ran across this couple. They were quite sociable, and came right over to the fence for their photo-op. They’re huge! 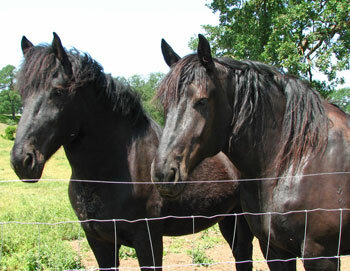 I’m guessing they’re Percherons. 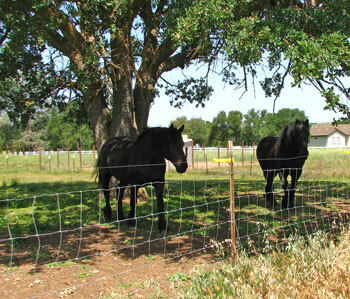 There are lots of “horse folks” here in the foothills, so we see all kinds of horses. This particular day, we had a friend visiting from the city, and she was excited every time we ran across some wildlife or livestock that she had never seen “in person.” So, we enjoyed the view through her perspective that day, and we stopped to take a picture too.